Function as traditional communication way From Bangkalan. Tom-tom as a trditional communication, until now is still have important role specially in counties, eventough technology development increasing very fast but tom-tom still useful, such as in field of security was used as night watch activities, also used as a watch. Alexander Graham Bell�s telephone was made in 1882. From Stedelijk Historisch Museum Surabaya. Telephone is a partically in communication. It is not wondering if incerasing rappidly. This telephone is a one of a model from Alexander Graham Bell�s telephone was made in 1882, perfecting from the first telephone who was made by Samuel F. B. Morse in 1852 which is a telegraph magnetic. This Alexander Graham Bell�s telephone is used equipment talk system uses separate battery with the receiver equipment. This collection is a gift from Chief of Irigation Brantas Mojerkerto teritorial in December 15th, 1934. As an instument to search fishes and as an instrument sea transportation. Same kind as a boat (dug out) from Stedelijk Historisch Museum Surabaya. 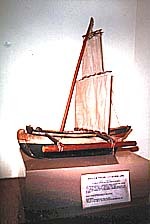 This collection is a model of Madura�s Long Boat same kind as a boat. For the benefit of sea transportation and as an isntrument to search of fishes for Indonesian peoples. 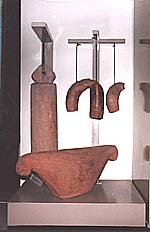 As an instrument to search fishes and as an sea transportation from Stedelijk Historisch Museum Surabaya. This deep sea fishing boat is completed with cadik which is function a balance instrument. Because this boat is only have a small screen, so this boat is only used in beach sailing or small waves. This boat was made commonly in Tanjung Bumi Madura Island. As a traditional transportation from Stedelijk Historisch Museum Surabaya. From Stedelijk Historisch Museum Surabaya. The fist model of cycle was made by Michael Kesler from german in 1766. This cycle speed is only 15 kilometers/hours. From Stedelijk Historisch Museum Surabaya. Made by James Starley and William Hilam from England who have patent in 1870. From Stedelijk Historisch Museum Surabaya. Donated by the police museum of Surabaya who was sent by Mr. T.T.Bent on November 13rd , 1934. The first contruction was build by a Germany man, his name is Gottlieth Daimler. This motor cycle speed is only 30 kilometers/hours.